3. Clinical Psychologist - a) I or II class M.A/ M.Sc. degree in Psychology OR equivalent qualification in Psychology of a recognized University / Institution AND b) DMP / DMSP / M.Phil in Medical & Social Psychology OR equivalent qualification from a recognized University/Institution. 4. Clinical Psychology (Scheme -B) - a) I or II class M.A/ M.Sc. degree in Psychology OR equivalent qualification in Psychology of a recognized University / Institution AND b) DMP / DMSP / M.Phil in Medical & Social Psychology OR equivalent qualification from a recognized University/Institution. 5. Psychiatric Social Worker - a) I or II class Master’s Degree in Social Work from a recognized University / Institution AND b) I or II Class two years M.Phil in Psychiatric Social Work from a recognized University / Institution. 6. 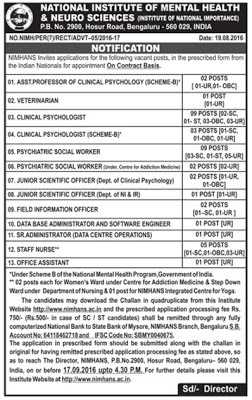 Psychiatric Social Worker (Under, Centre for addiction medicine) - a) I or II class Master’s Degree in Social Work from a recognized University / Institution AND b) I or II Class two years M.Phil in Psychiatric Social Work from a recognized University / Institution. 7. Junior Scientific Officer (Dept. of Clinical Psychology) - M.A in Psychology I or high II class with M.Phil in Medical & Social Psychology. 8. Junior Scientific Officer (Dept. Of NL & IR) - Post Graduation (M.Sc/B.Tech/MBBS) with three years experience in Image processing and sequence programming using Matlab and Linux based Neuroimaging tools. 9. Field Information officer - Master in Sociology, Rural Development, Economics, Human Resources, Social Work or equivalent. 12. Staff Nurse - Pass in PUC or equivalent and b) Registered “A” Grade Nurse under any State Nursing Council OR B.Sc Nursing with Registration under any state Nursing Council. 13. Office Assistant - Any Degree from a recognized University /Institution.